Designed to be a simple loop-back advertising player, the Liymo HD Plug and Play Looping Media Player for Digital Signage offers a straightforward remote advertisement playback system at a competitive price. The best feature is that you will be able to change which ever video file is currently playing from anywhere in the world, which allows for adaptability in advertising without the need for an engineer to travel to remote sites and switch out storage media. If the player is powered down in the field and then powered back up - it will reconnect by itself and begin to play media without any need for physical interaction. Based around a modified Android operating system and installed with our proprietary video playback software, you simply plug in the HDMI cable, power up the player and it will automatically load your chosen video from a designated Dropbox account. Playback will run either until the system is powered down, or until you choose to replace the video file. 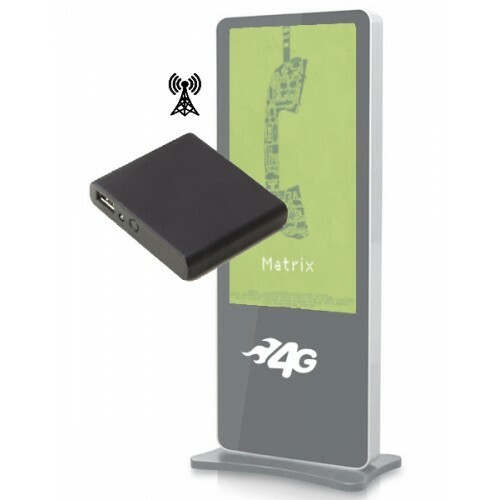 4G connectivity is made using the local cellular data system, meaning you can use a SIM card of your choice connected to your own network to do so. This offers the flexibility for you to set up your own data plan, and tailor it to your expected data usage. Operation of the system is as easy as 1... 2... 3... !! 1. Encode your video as a .mp4 file. 3. Let the media player download the file and let it play! A key benefit of this system is that you can deploy it remotely to a location, and set it running. As soon as it connects to the 4G data network it will synchronize the on board video file with the one you have placed in the Dropbox account.